The 1001 Inventions Blockbuster Exhibition opened in Dhahran, Saudi Arabia, on the 21st of June 2012 as an anchor attraction at the Saudi Aramco Cultural Program (SACP). The international award-winning show will welcome visitors to its latest installation at the Aramco Cultural Park in Dhahran, Saudi Arabia, until the 18th of July 2012 followed by a short break and then re-opens from the 20th August 2012 for ten more days. 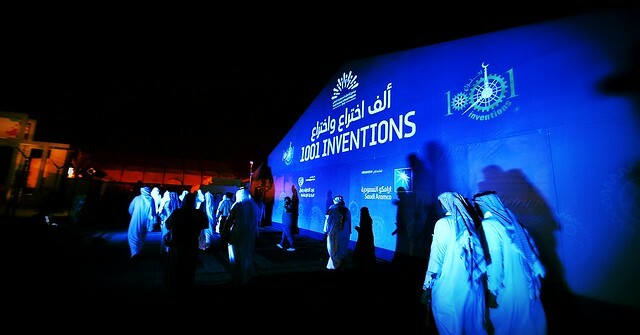 Following successful residencies in London, Istanbul, New York, Los Angeles and Abu Dhabi where it has attracted a combined audience of 2 million, 1001 Inventions has partnered with Saudi Aramco to introduce this blockbuster exhibition to audiences in Saudi Arabia for the first time. 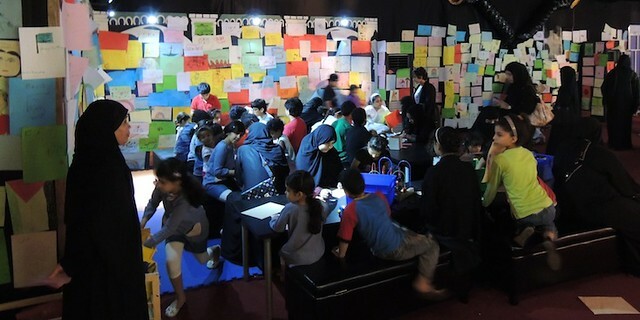 Children create a large wall of artwork depicting their favourite inventions from Muslim Civilisation. The Kingdom-wide 2012 Saudi Aramco Cultural Program, is an array of entertaining, educational and athletic activities for everyone. A series of events including arts, culture, heritage, education, sports and entertainment taking place in Dhahran, Riyadh, Jiddah, Abha, Najran and Medina. Large queues outside the 1001 Inventions exhibition in Dhahran. Over 15,000 people visited the exhibition in the first 6 days. The Foundation for Science, Technology and Civilisation (FSTC) is the global academic and knowledge partner for 1001 Inventions. FSTC is an international network of historians, scientists, engineers, educationalists and museum professionals working to popularise awareness of the historic roots of science. By highlighting role models from the past and how their achievements and inventions live on in the modern world, FSTC aims to inspire young people to pursue careers in science, technology, engineering and mathematics. Further information is available on FSTC's popular website www.FSTC.org.uk. Construction of the new 1001 Inventions touring exhibition was sponsored by Abdul Latif Jameel Community Initiatives (ALJCI). ALJCI is the Corporate Social Responsibility arm of the ALJ Group, which is a Toyota automobiles distributor in 13 different countries. ALJCI plans and operates numerous global programs, such as poverty-alleviation initiatives, artistic and educational projects and technology innovation grants, including a long history of scholarships for students at Massachusetts Institute of Technology. For further information about Abdul Latif Jameel Community Initiatives visit www.aljci.org.